The Brunswick Room was given its name because it used to be part of the bowling alley. 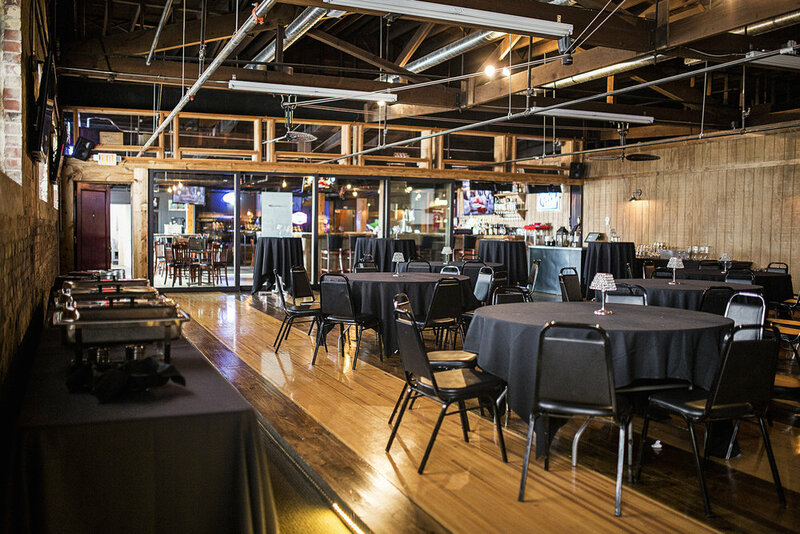 The room displays the original bowling floor with open view of the pin setters and a beautiful glass wall that adds privacy to any event. A beautiful peak ceiling and paddle fans add to the flavor of the ambiance. This room will hold up to 100 guests if seating is needed or 150 for a “flowing reception”. It’s also great for meetings and gatherings that want to incorporate power point presentations. A drop down screen and four televisions are located around the room for easy viewing. An entrance door is located on the second floor of the parking garage for easy access. The Findlay Room is located at the rear of the building, featuring a 12 foot high ceiling, original exposed brick and 9 elegant chandeliers; this registered Hancock County Historical Site space is perfect for more formal events. The warehouse also features a private, full service bar, projector, sound system, dance floor and 24' x 8' stage. For a seated event we can accommodate 250 seated guests comfortably. With a dance floor in place, we can seat up to 225 guests. If a ‘flowing style’ reception is preferred, then the space will allow for 300 guests. Book your wedding reception with us & receive a $100 gift card towards services from Your Perfect Day Wedding Planning Services, a complimentary consultation, preferred vendor list, & champagne for the wedding party! With tasty pub fare, 50 beers on tap, weekly live music, and 2 gorgeous event spaces, we've got it all. Sip on delicious craft beer in the Taproom, listen to live music every weekend in The Upper Deck, or sit back and relax on our rooftop tiki-bar, La Vista. If you are looking for a beautiful and unique venue for your wedding reception or special event, we have two of the most unique event spaces in Northwest Ohio.